When Carole was young, we were looking for something to get her interesting in collecting. A hobby is a nice thing, particularly when it captures the imagine and spurs you to become knowledgeable about it. At the time, we had a friend who was a philatelist. This struck us as a good hobby because it wouldn't take up much room. My grandfather was a philatelist and his collection contained some interesting stamps. So, we started assembling the items for this hobby. We were told to collect only the stamps we liked. 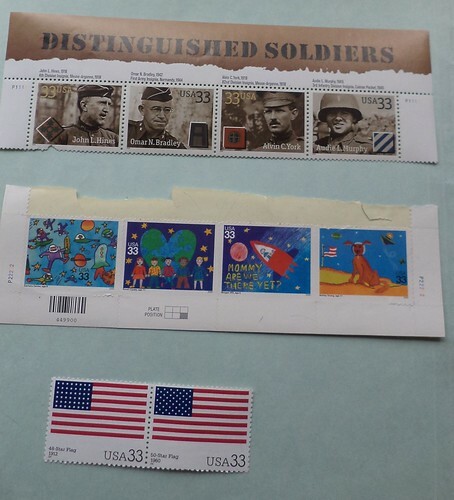 The US Postal Service has encouraged people to become stamp collectors as it spurs sales. I had a pen pal in England and she would send us interesting stamps on her letters as well as in her letters. We gradually amassed a goodly amount. I even bought stamp pages to carefully keep our stamps clean and dry. Now that she's off on her own and has formed her own tastes. She decided she really doesn't have an interest in stamp collecting. I have a lot of collections but my tastes don't run to stamps. When she said she didn't care about them, I decided to start using these on my correspondence. I'm sure a few readers will gasp in horror, but I don't really have legendary or rare stamps. "You should have put them up on eBay." Perhaps, but I don't know how to effectively market them so I used them. Saving money on postage when I don't have much money in the first place makes sense to me. I am now down to the last of the stamps. I would say that 80% of the stamps I have used have been of the 33 cent variety. I have some first day issues and a sheet of Civil War stamps I feel I should sell. I don't think I'll sell the Bugs Bunny sheet. And I have a whole bunch of stamps from overseas. I'm not sure what to do with those or the binder with all the collection pages in it. In a way, it feels sad. It's the end of a period of life. These stamps have helped me get letters and cards out when I couldn't have sent anything because of finances. As I worked through them, I realized there wasn't an emotional connection to them. They were, for me, just stamps. In the slow clean out of a home to make it more comfortable, I need to cultivate that dispassion. I maybe also need to learn how to post things for sale on eBay.